Being healthy is not just about eating healthy meals and doing proper exercise. Being healthy is all about knowing the whole story as well. Eating your meat, fruits, and vegetables is as important as knowing how your chickens, pigs, and cows are raised, where your fruits and vegetables are coming from, and what ingredients are in your food and products. This is where Healthy Options comes in. 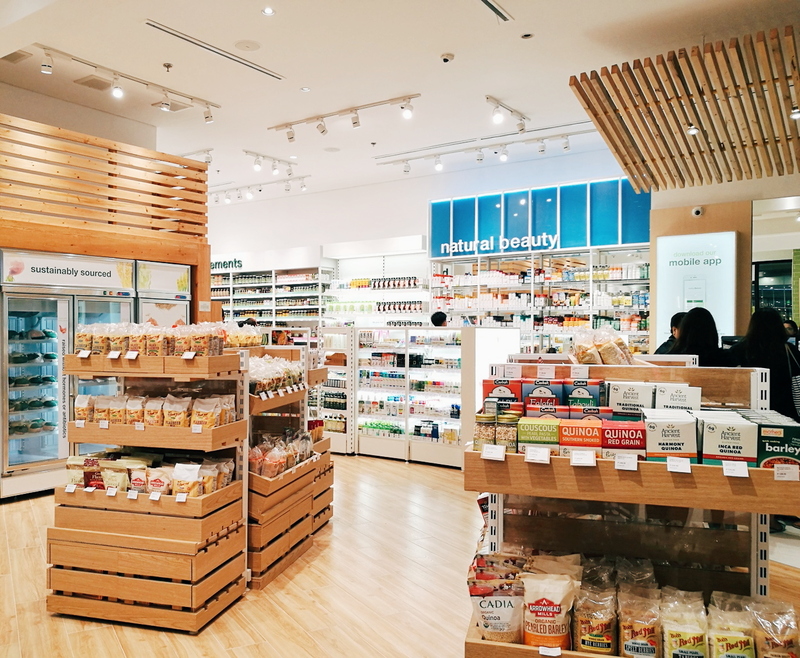 With their several stores nationwide, Healthy Options envisions a healthier world by encouraging us to value our health by eating well and choosing natural products. I have been an occasional Healthy Options customer but during my shopping experience at their newly-redesigned and expanded store in SM City Cebu, I swear I'm going to be a regular. I love that we now have healthier options for our groceries, meat products, vitamins and supplements, and even skincare and beauty products. My boys and I went on a shopping spree last weekend at the Healthy Options store in SM City Cebu located at the upper ground floor in North Wing Atrium. I think we took a good 20-30 minutes roaming around thinking of what we should get. I was already fixed in getting myself the Dickinsons Original Witch Hazel Pore Perfecting Toner and the Aztec Secret Indian Healing Clay. But I was confused on what others to put in my cart with so many options available from the five sections. Our first stop was the Grocery section. I think most, if not all, of the products here are gluten-free and sugar-free. There are so many options from pasta, condiments, "healthy" junk food, milk, teas, and so many more! What we got from this section was a box of chocolate cereal, three cartons of milk (1 soya milk and 2 hazelnut chocolate milk), instant oatmeal, cocoa powder, and a box of peppermint tea. Next, we went on to the Chilled & Frozen section. I was honestly surprised that they have this section here because I never noticed it before on the "old" store. Their meat may be a bit pricier than what we usually buy in local market and supermarkets, but at Healthy Options, we are guaranteed with all natural meat with no added hormones or antibiotics which makes it safer for us to eat. Next, we went to the Baby & Kids section to see what we can get for Zayn. We asked him to search for something he wants but what he chose was food for infants. Haha. So we opted for his chocolate cereal at the Grocery section instead. But do know that they really have age-appropriate products available for your kids. All supplements at Healthy Options are guaranteed pure and without any hidden ingredients, fillers, and additives. I searched for something I could try and I found the Collagen supplement. I was already about to put it in the cart but I don't know why I placed it back on the rack. Boo! But I swear, I'm gonna get it on my next Healthy Options shopping next month! Haha. Last but not least, and my favorite section, Natural Beauty. This is where I took most of the time choosing for something I wanted to buy. Of course, I instantly placed the toner and the healing clay mask in my cart but I was confused on what else I should get. There were so many to choose from but my boys were waiting. I ended up getting a lip balm with the SPF 18 but I had no regrets. So this is what our cart looked like during our shopping experience at Healthy Options (though there were some not included in the photo due to last minute decisions). The three of us were really happy with what we got, most especially Zayn. The next morning, he had his cereal and a glass of soymilk. We really had fun shopping at Healthy Options that Sheen and I had a mutual agreement of patronizing their products more so that Zayn will grow up eating healthy and natural food moving forward. How about you? Have you tried shopping at Healthy Options? You should get it! You can try the travel size for trial lang muna. That's what I did before. I think it's just around Php 80+. The buy the biggest size if nahiyang ka sa toner. The largest bottle is Php 399 for 475mL. It's so sulit, it'll last you more than 3 months! I love Healthy Options particularly because of the Dickinsons Original Witch Hazel Pore Perfecting Toner and the Aztec Secret Indian Healing Clay, too! Holy grail ko mga yun. Haha. But other than that, I can't seem to buy anything else na (esp food), bc organic/healthy food tend to be more expensive. Haha! Their push carts are indeed cute! Woah! This is huge. Good thing we're visiting Cebu this weekend and will definitely drop by healthy options. It is unfortunate that we don't have a store here locally. That surely seems humongous! So much to choose from. Love when there is so much variety on offer! Lets us choose the most organic ones! No wonder your trolley is filled to the brim! Haha true! If only I had more budget, I'll have two carts filled in! Healthy Options is a favorite place. Love their spread of healthy chips which i like hoarding everytime i visit! This branch in Cebu is superb! It looks really big and there's so much into it! I LOOOVE Healthy Options! I was actually just there today, checking out the Herbatint hair color. The items there are a little pricey, but hey, at least you know that what you're getting is good for you. That branch in SM Cebu is huge! I would probably spend hours there, just browsing through their sections. Good to know you were happy with your purchases. I also have the witch hazel toner and the Indian clay mask in my bathroom now! :) Good stuff! Me too! If not for my nagging partner and kid who wanted to go home, I would've spent hours just roaming around and browsing carefully through each section. Haha. The toner and the clay mask are amazing! I am glad they are promoting more organic products. Too much chemical contaminated food stuffs are taking a toll on our health. I like the choice given here. I am also changing the food options now and as a consumer we have a larger role to play. There are so many healthy options at Healthy Options. Going through its selves is fun and truly enjoyable. We also ger a few of our needs there. They even have cheaper vitamins and minerals. Some chips though we find too expensive but then we pay for the healthy options. True! I checked their supplements and vitamins and they're affordable considering that some of them are good for 3 months or more use.